The book titled “Budget Optimization and Allocation: An Evolutionary Computing Based Model” caters to a critical need in today’s intellectual landscape, viz., the problem of budget optimization and distribution and its solution. The material covered in the book is an excellent balance of theory and practice. The techniques discussed the attempt to synergise evolutionary computation (mainly genetic algorithm) with traditional approaches to budget allocation like optimal allocation, equal allocation, etc. The attractiveness of the book comes from the fact that it takes as a case study the complex and vast problem of union budget of India. The macro and micro issues discussed with attention to details, with the growth rate being the final aim of the budget exercise. The second attractive aspect is that the authors compare and contrast the budget allocation practices of different countries, consistent with country’s economy, culture, population, etc. The final attractiveness is the use of very modern methodologies like evolutionary computation to tackle incremental budgeting. This book will be found useful by graduate students in their research. I congratulate the authors on taking up a very timely and relevant problem. 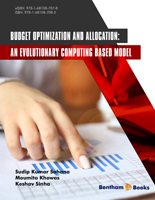 This book builds up an innovative framework for budget optimization and allocation using Evolutionary Computing (Genetic Algorithm) in addition to conventional techniques (OCBA, EA) to get synergy from each technique. Chapter 1 gives the introduction about the budget and its importance and challenges of budget allocation in the national and global economy. The author explains the pros and cons of budget allocation. Chapter 2 deals with the various traditional approaches for budget allocation. Moreover, a subsequent number of researchers performed by different researchers on this topic. In depth, literature has been presented in this chapter to make a foundation for creating a research methodology on this subject. Chapter 3 presents the proposed methodology and models for allocation and optimization. Here, Growth Rate is displayed as a parameter for allocation, explaining how evolutionary computing technology is used for optimization in this chapter. Chapter 4 highlights the results and discussions of the different test cases of proposed budget optimization technique and allocation of the budget applied to the different schemes in the secondary education system in the MHRD department as a case study. The output of budget allocation is drawn and compared to the current budget technique. This book is research oriented and side by side, it has practical implementation details of the research theme. Textbooks and reference books are available in the market, but that discusses only standard theories. This book is specialized and has a credit to give new ideas and implementation details in this field.